What do the worlds best project managers do to be so successful? More successful projects (satisfied customers and project team, full-scope, on-time, under-budget). Clear signals on when to take action on the project. Reduced pressure on project team members. Reduction of the waste that causes project delays: Multi-tasking, Queuing, Student Syndrome, Parkinson's law. Align your project stakeholders so they help you achieve project success. Create a project solution that really meets your stakeholder's needs. Plan your work so that your project team can complete their contributions with little stress. Apply simple project measurement to help your project team and assure everyone who cares about your project knows what they need to know, when the need to know it. Complete your projects in "half the time, all the time." A new eBook by the author of the best selling Critical Chain Project Management, Lean Project Management takes you through the key steps to project success. Written for project managers taking on more challenging projects, or wanting to complete projects faster and with less team stress, Lean Project Management helps you identify and deploy the keys to project success. I consider some of these secrets as hiding in plain sight, because the project literature discusses some of them in one form or another. The first problem is that they are hidden in thousand page books with many things that aren't going to help your project. The second problem is that most project managers don't do them, leading to the high rate of project failure and dissatisfaction. Lean Project Management is a simple path to overcome both problems. Focus on what matters most for your unique projects and project environment. LPM builds on the understanding that no other project has been or will be exactly the same as the one you are running now or preparing to run. Learn the secrets that project experts have used to successfully deliver projects that satisfy everyone's needs, and sometimes end up as the fondest memories that people have. Also learn how the improved method of Critical Chain Project Management (CCPM) can add that supercharger to your projects. Many project managers that have switched to CCPM report successfully completing projects in half the time, or less, with much less stress for the project team. This book does not spend time with the theory behind the secrets, but rather focuses on giving you what you need to use them. Although I am a Project Management Professional (PMP), certified by the Project Management Institute, (or, maybe because of it), I know you do not have to do everything in those thick project management books to succeed at projects. Many people that write those books have never run real projects, and will lead you down a path of creating piles of useless paperwork. Not only does that paperwork not help your project, it diverts people's attention from what matters most. Lean Project Management takes a practical approach, with simple steps to use the secrets. Have your project up and running in as little as a couple of days with the eight principles. LPM includes all of the steps that I use to lead teams to complete projects in half the time, all the time with CCPM. You can be the first in your company to demonstrate the success possible with the new critical chain approach. You will find interesting and immediately useful insights and steps, whether you are just learning project management fundamentals, or are a certified Project Management Professional (PMP) like me. Now, here is the unique advantage of Lean Project Management. I have built the ideas of CCPM seamlessly into Lean Project Management from the beginning. Although I did not know about critical chain project management when I was taught effective project delivery over thirty years ago, I immediately saw how the critical chain idea explained some of the things that led to project success. I also could see immediately that many of the practitioners of the critical chain scheduling approach, and of the Theory of Constraints (TOC) did not understand some of the other necessary aspects of project management necessary for success. So I defined CCPM way back in 1997, as the way to bring together the key elements of professional project management and the critical chain scheduling and control ideas. More recently, I have studied and incorporated the complementary principles and practices of Lean manufacturing into the project delivery process. Lean Project Management provides a complete solution. NOTE: The Excerpt includes color figures. The printed book does not include color. I became frustrated with the relatively high cost of published hard cover books. While I encourage you to buy mine because of the professional quality and material it contains, I want to see the benefits of my experience with successful project delivery including CCPM and Lean reach a much broader audience. So, I decided to write a new book that would be more accessible to a wider range of project managers managing all kinds of projects. To keep the costs down to an absolute minimum, an eBook is the best way for many. You can always have it with you on your computer, and you can use electronic functins with it such as search and project it on a screen. Normal price for the electronic version is $39.95. Buy the electonic version for a special discount price of only $29.95! You can use any credit card, and you do not have to be registered with PayPal any more to enjoy a secure purchase. 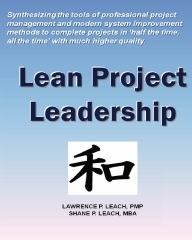 After you place your order, we will Email Lean Project Management to you within three days. The file is nearly three megabytes, so be sure to use an Email to order that will handle a file of that size. Please Email us if you wish to make a volume purchase of the ebook. NEW: available in hardcopy. Click here! I wish the the best of project success! Note to Purchasers of Eight Secrets to Supercharge Your Projects: Lean Project Management is a second edition of Eight Secrets. The first and second chapters are updated substantially, and it contains a new glossary and index. Lean Project Management also contains other minor updates throughout. Send us an Email if you would like a free upgrade. PS: You are not going to find as effective a project management book, period. And at this price, you just can't afford to waste another minute missing out on even one of these secrets! Many project management books (including my own published Critical Chain Project Management: Second Edition) approach $100, and are going to take you much longer to read and understand.